The following is a list of monastic houses in North Yorkshire, England. Alien houses are included, as are smaller establishments such as cells and notable monastic granges (particularly those with resident monks), and also camerae of the military orders of monks (Knights Templars and Knights Hospitaller). The numerous monastic hospitals per se are not included here unless at some time the foundation had, or was purported to have the status or function of an abbey, priory, friary or preceptor/commandery. 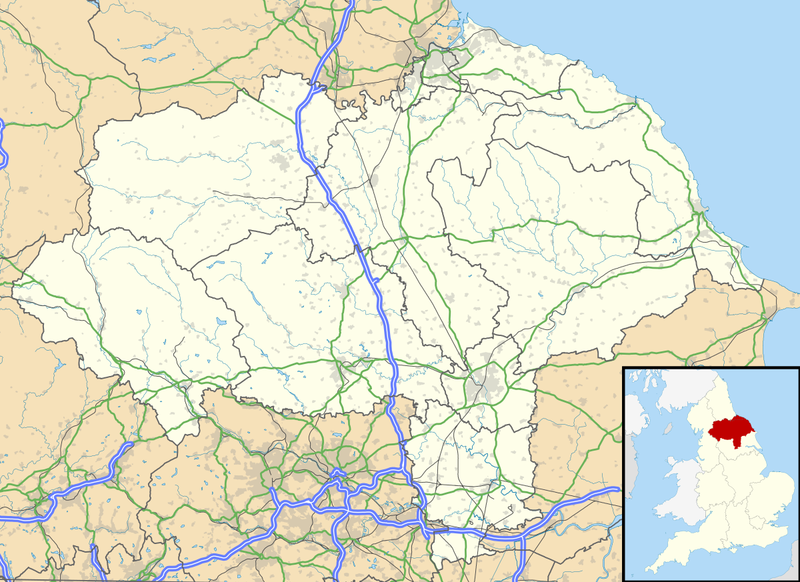 The name of the county is given where there is reference to an establishment in another county. Where the county has changed since the foundation's dissolution the modern county is given in parentheses, and in instances where the referenced foundation ceased to exist before the unification of England, the kingdom is given, followed by the modern county in parentheses. remains limited to earthworks etc. Locations with names in italics indicate probable duplication (misidentification with another location) or non-existent foundations (either erroneous reference or proposed foundation never implemented) or ecclesiastical establishments with a monastic appellation but lacking monastic connection. York Monastery, earlier site Culdees? ^ Historic England. "ST MARTINS PRIORY (55107)". PastScape. Retrieved 1 January 2012. ^ Historic England. "ST MARTINS CHURCH (55098)". PastScape. Retrieved 1 January 2012. ^ Historic England. "ARDEN PRIORY (57654)". PastScape. Retrieved 1 January 2012. ^ Historic England. "BAYSDALE PRIORY (28027)". PastScape. Retrieved 1 January 2012. ^ Historic England. "BOLTON PRIORY (48289)". PastScape. Retrieved 1 January 2012. ^ Historic England. "Monument No. 1166612". PastScape. Retrieved 1 January 2012. ^ Historic England. "CHURCH OF ST MARY (1168116)". PastScape. Retrieved 1 January 2012. ^ Historic England. "GREAT BARN (522682)". PastScape. Retrieved 1 January 2012. ^ Historic England. "Monument No. 1168088". PastScape. Retrieved 1 January 2012. ^ Historic England. "BYLAND ABBEY (56808)". PastScape. Retrieved 1 January 2012. ^ Historic England. "COPMANTHORPE TEMPLARS PRECEPTORY (56376)". PastScape. Retrieved 1 January 2012. ^ Historic England. "COVERHAM ABBEY (50885)". PastScape. Retrieved 1 January 2012. ^ Historic England. "DRAX PRIORY (57907)". PastScape. Retrieved 1 January 2012. ^ Historic England. "EASBY ABBEY (21624)". PastScape. Retrieved 1 January 2012. ^ Historic England. "EAST COWTON TEMPLARS PRECEPTORY (25548)". PastScape. Retrieved 1 January 2012. ^ Historic England. "ELLERTON PRIORY (48742)". PastScape. Retrieved 1 January 2012. ^ Historic England. "ST MARY AND ST CUTHBERTS PRIORY (48335)". PastScape. Retrieved 1 January 2012. ^ Historic England. "FORS ABBEY (47333)". PastScape. Retrieved 1 January 2012. ^ Historic England. "FOUKEHOLME PRIORY (55767)". PastScape. Retrieved 1 January 2012. ^ Historic England. "FOULBRIDGE TEMPLARS PRECEPTORY (64846)". PastScape. Retrieved 1 January 2012. ^ Historic England. "FOUNTAINS ABBEY (51860)". PastScape. Retrieved 1 January 2012. ^ Historic England. "INGETLINGUM (21539)". PastScape. Retrieved 1 January 2012. ^ Historic England. "GISBOROUGH PRIORY (28304)". PastScape. Retrieved 1 January 2012. ^ Historic England. "ABBOTS HOUSE (29376)". PastScape. Retrieved 1 January 2012. ^ Historic England. "GROSMONT PRIORY (29263)". PastScape. Retrieved 1 January 2012. ^ Historic England. "Monument No. 65749". PastScape. Retrieved 1 January 2012. ^ Historic England. "ST PETERS CHURCH (65824)". PastScape. Retrieved 1 January 2012. ^ Historic England. "HANDALE PRIORY (29026)". PastScape. Retrieved 1 January 2012. ^ Historic England. "HEALAUGH PRIORY (54769)". PastScape. Retrieved 1 January 2012. ^ Historic England. "HOOD GRANGE (57371)". PastScape. Retrieved 1 January 2012. ^ Historic England. "HUTTON PRIORY (27705)". PastScape. Retrieved 1 January 2012. ^ Historic England. "JERVAULX ABBEY (50837)". PastScape. Retrieved 1 January 2012. ^ Historic England. "KELDHOLME PRIORY (60244)". PastScape. Retrieved 1 January 2012. ^ Historic England. "CHURCH OF ST MICHAEL THE ARCHANGEL (591344)". PastScape. Retrieved 1 January 2012. ^ Historic England. "KIRKHAM PRIORY (59657)". PastScape. Retrieved 1 January 2012. ^ Historic England. "KNARESBOROUGH PRIORY (53253)". PastScape. Retrieved 19 September 2014. ^ Historic England. "CHURCH OF ST MARY (60718)". PastScape. Retrieved 1 January 2012. ^ Historic England. "LAZENBY GRANGE (53955)". PastScape. Retrieved 1 January 2012. ^ Historic England. "ST MARYS CHURCH (59881)". PastScape. Retrieved 1 January 2012. ^ Historic England. "ABBEY HOUSE (532364)". PastScape. Retrieved 1 January 2012. ^ Historic England. "MARRICK PRIORY (48745)". PastScape. Retrieved 1 January 2012. ^ Historic England. "MARTON PRIORY (56699)". PastScape. Retrieved 1 January 2012. ^ Historic England. "MIDDLESBROUGH PRIORY (27046)". PastScape. Retrieved 1 January 2012. ^ Historic England. "MOUNT GRACE PRIORY (55685)". PastScape. Retrieved 1 January 2012. ^ Historic England. "MOUNT ST JOHN (55564)". PastScape. Retrieved 1 January 2012. ^ Historic England. "MOXBY PRIORY (56702)". PastScape. Retrieved 1 January 2012. ^ Historic England. "NEWBURGH PRIORY (56813)". PastScape. Retrieved 1 January 2012. ^ Historic England. "NORTHALLERTON WHITEFRIARS (53978)". PastScape. Retrieved 1 January 2012. ^ Historic England. "NUN APPLETON PRIORY (1067066)". PastScape. Retrieved 1 January 2012. ^ Historic England. "NUN MONKTON PRIORY (56574)". PastScape. Retrieved 1 January 2012. ^ Historic England. "NUNTHORPE PRIORY (27748)". PastScape. Retrieved 1 January 2012. ^ Historic England. "PENHILL TEMPLARS PRECEPTORY (48680)". PastScape. Retrieved 1 January 2012. ^ Historic England. "RIBSTON HALL (53397)". PastScape. Retrieved 1 January 2012. ^ Historic England. "RICHMOND GREYFRIARS (21633)". PastScape. Retrieved 1 January 2012. ^ Historic England. "ST MARTINS PRIORY (21627)". PastScape. Retrieved 1 January 2012. ^ Historic England. "RIEVAULX ABBEY (57047)". PastScape. Retrieved 1 January 2012. ^ Historic England. "RIPON MINSTER (53767)". PastScape. Retrieved 1 January 2012. ^ Historic England. "ROSEDALE ABBEY (60492)". PastScape. Retrieved 1 January 2012. ^ Historic England. "HATTERBOARD (79938)". PastScape. Retrieved 1 January 2012. ^ Historic England. "ST MARYS CHURCH (79987)". PastScape. Retrieved 1 January 2012. ^ Historic England. "SCARBOROUGH BLACKFRIARS (80079)". PastScape. Retrieved 1 January 2012. ^ Historic England. "SCARBOROUGH GREYFRIARS (80077)". PastScape. Retrieved 1 January 2012. ^ Historic England. "SCARBOROUGH WHITEFRIARS (80078)". PastScape. Retrieved 1 January 2012. ^ Historic England. "SELBY ABBEY (58066)". PastScape. Retrieved 1 January 2012. ^ Historic England. "SKEWKIRK HALL (55118)". PastScape. Retrieved 1 January 2012. ^ Historic England. "STOCKING ABBEY (57386)". PastScape. Retrieved 1 January 2012. ^ Historic England. "Monument No. 53870". PastScape. Retrieved 1 January 2012. ^ Historic England. "TEMPLE MANOR (56180)". PastScape. Retrieved 12 December 2011. ^ Historic England. "THICKET PRIORY (58095)". PastScape. Retrieved 1 January 2012. ^ Historic England. "CHURCH OF ST MARY (53668)". PastScape. Retrieved 1 January 2012. ^ Historic England. "WESTERDALE TEMPLARS PRECEPTORY (27905)". PastScape. Retrieved 1 January 2012. ^ Historic England. "WHITBY ABBEY (29830)". PastScape. Retrieved 1 January 2012. ^ Historic England. "WHITLEY TEMPLARS PRECEPTORY (56214)". PastScape. Retrieved 1 January 2012. ^ Historic England. "WYKEHAM PRIORY (65464)". PastScape. Retrieved 1 January 2012. ^ Historic England. "THE FRIARAGE (26968)". PastScape. Retrieved 1 January 2012. ^ Historic England. "YEDINGHAM PRIORY (62239)". PastScape. Retrieved 1 January 2012. ^ Historic England. "AUGUSTINIAN FRIARY (534932)". PastScape. Retrieved 1 January 2012. ^ a b Historic England. "YORK BLACKFRIARS (1320904)". PastScape. Retrieved 1 January 2012. ^ Historic England. "ST CLEMENTS PRIORY (534869)". PastScape. Retrieved 1 January 2012. ^ Historic England. "YORK FRIARY OF CRUTCHED FRIARS (1318971)". PastScape. Retrieved 1 January 2012. ^ Historic England. "ALL SAINTS CHURCH (1302352)". PastScape. Retrieved 1 January 2012. ^ Historic England. "YORK FRIARY OF FRIARS OF THE SACK (1322378)". PastScape. Retrieved 1 January 2012. ^ a b Historic England. "FRANCISCAN FRIARY (534934)". PastScape. Retrieved 1 January 2012. ^ Historic England. "HOLY TRINITY PRIORY (56606)". PastScape. Retrieved 1 January 2012. ^ Historic England. "ST ANDREWS PRIORY (58160)". PastScape. Retrieved 1 January 2012. ^ Historic England. "YORK WHITEFRIARS (1155211)". PastScape. Retrieved 1 January 2012. ^ Historic England. "CARMELITE FRIARY (534931)". PastScape. Retrieved 1 January 2012. ^ a b Historic England. "ST MARYS ABBEY (56602)". PastScape. Retrieved 1 January 2012. ^ Historic England. "ST LEONARDS HOSPITAL (58179)". PastScape. Retrieved 1 January 2012. ^ Historic England. "YORK MINSTER (58299)". PastScape. Retrieved 1 January 2012. Morris, Richard (1979) Cathedrals and Abbeys of England and Wales, J. M. Dent & Sons Ltd.
Wright, Geoffrey N., (2004) Discovering Abbeys and Priories, Shire Publications Ltd.
English Cathedrals and Abbeys, Illustrated, Odhams Press Ltd. This page was last edited on 1 April 2019, at 06:40 (UTC).